Having a sea or river view is always an added bonus when purchasing a property. When the chance to self build a house near water becomes a possibility there are certain considerations to take into account before we sign a contract on the dream plot. Building close to water will attract added costs to the build. Erosion to foundations by the water, possible flooding and damp are all considerations when building by or close to water. Homes may have to be built higher than usual, on stilts perhaps to evade floodwater damage. Foundations may have to be deeper. Both of these examples will add drastically to the cost of the building project. Your architect will have to design a house that will withstand all damage that can be caused by water and flooding. When considering a build close to a river speak to other residents about flooding issues. Take time to do your own research into water damage by reading back issues of local newspapers, these can be found on micro fiche in libraries and the offices of the newspaper. Planning officials at the local council can also advise as they will be working with you when the building plans are finally submitted. Insurance on homes close to water have risen dramatically over the past few years. The climate change in recent years has seen flooding in many homes near rivers. News bulletins of homes ruined by water is now commonplace. Building or indeed purchasing a home near water will have a dramatic rise on your home insurance policy. Shop around for a quote and if new to the area where you wish to build. Speak to close neighbours who would have already researched suitable insurance companies who not only charge a reasonable rate for a policy but also provide a reliable and quick response if you should have to leave your home after a flood. Sometimes a self builder will purchase a property and either renovate or knock it down and rebuild a home to their own design. Water mills and warehouses can be found by rivers and make ideal renovation projects. However the buyer needs to check to see if the property is listed and if so what are the requirements to make the building habitable once more? The restrictions may be too severe for a self builder especially if local historical groups are involved in protecting local heritage sites. Buying a building plot that has a sea or river view does not give you exclusive right to the view. It may be that your view one day becomes obliterated by another building be it a house, apartment block or offices. This is in the lap of the gods. You can check with the local planning department to see if the land between you and the water is green belt or is likely to be built upon in the foreseeable future. When it comes to selling a home by a river or near to the sea that it commands a higher price than a similar house without the water access or view. 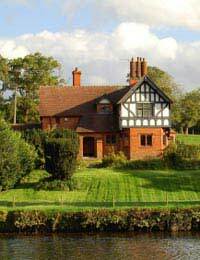 Many estate agents have a department that specialises in these types of homes as they are attractive to the fisherman, sailor and those seeking a rural and relaxing lifestyle. There is talk of council tax charges reflecting pleasant views when rates are decided which is another cost to the self builder who builds close to water.